Week 5: Anatomy, Physiology, and High Scores! This week was short since Thanksgiving fell on a weekday but we still learned so much. 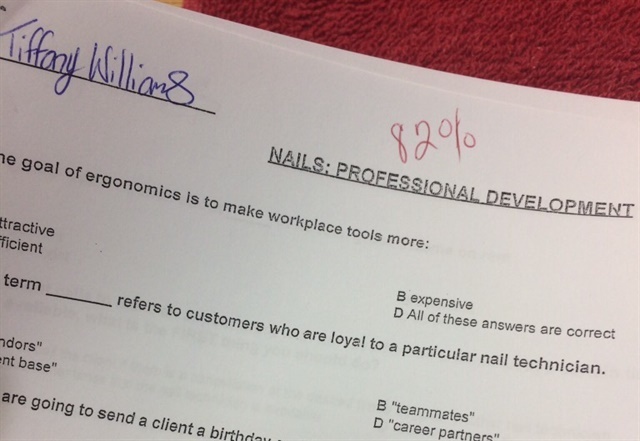 On Monday, we got our test scores back from our first exam and I got 82%! We started Unit 2, which is all about science. We started with the chapter on anatomy and physiology and learned about the different types of structures located inside the body -- cells, muscles, bones, and so much more. We also learned the steps for doing a manicure and the setup we should have. On Tuesday, we had a pop quiz on anatomy and physiology, and I got 90%! I'm so proud of myself because this is something that I really love and am dedicated to succeeding at, and my scores are proving it. Another great thing about our class is that every time somebody graduates we have a dinner celebrating them and everybody brings something. We had a lot of food and desserts this week, and after everybody ate we did our presentation for our business plan.This was a really fun week for me! I hope everyone had a wonderful Thanksgiving.Thanks for reading and I'll see you in Week 6!